Many residence and visitors today value Louisville for its peaceful surroundings. But in the 19th Century, Louisville was akin to a boom town. The Foster family owned a great deal of land in Louisville and may have been the most influential family in Louisville. Foster’s Storehouse, now a building almost two centuries old, guards the entrance to Louisville Point Park. The building’s name was changed to Harper Brothers General Merchandise Store around 1894 and remained open until 1938. Louisville grew so much that it was incorporated into a town in 1851. But as time went on, Louisville’s status as a town disappeared. “It is not known when Louisville stopped being a town,” Mummert said. Regaining status as a town was not a quick task, and Louisville did not become a town again until 1990. Tennessee was a border state in the Civil War; the state was a haven for both the Confederacy and the Union armies. It is documented that both the armies of the North and South raided Louisville at one time or another. The railroad helped Louisville to obtain a post office. 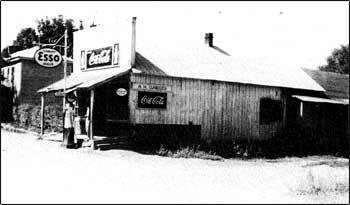 The mail came by train, which made it easy to annex a post office around the Harper Brothers General Merchandise Store. The post office remained opened until 1943. As the 20th Century came, Louisville’s prominence began to dwindle. “There was a gradual decline in Louisville’s economic activity,” says Mummert. “Aluminum and marble became big factors in Louisville becoming a residential area. People were being bused to places like Alcoa around 1913 for work. The Great Depression swept through the country without mercy, and Louisville was not an exception. The Tennessee Valley Authority was created in 1933. It did not take long for TVA to make plans for the river system. The first plan came out in 1934, with many other plans to follow – all leading up to the construction of Fort Loudoun Dam. The structure was finished in September 1943, and it took two weeks for the river to come up and swallow most of Louisville. An estimated 70 percent of Louisville was put under water. Some homes and buildings were relocated to Louisville Road. After the flooding, some of the land that remained resembled pasture. Something had to be done with it. “Likely as a move to encourage public recreation, the park was built and leased to Blount County Park and Recreation in the early 1970s,” says Mummert. There is also a pavilion used by the public for various types of occasions. “We have seen church baptisms, company picnics, school field trips and several other kinds of groups that use the area around the pavilion,” says Mummert. Mummert and other Louisville historic conservationists are always looking for more history about the area. Individuals who have historical items or information to contribute should call Louisville Town Hall at 865-681-1983. The Town History Committee is an Ad Hoc committee whose purpose is to assist the mayor and community by developing a comprehensive history of the Town of Louisville and its citizens. This pictorial and written history will be made available for all citizens at the Town Hall and on the Town of Louisville website. Members are nominated by the mayor and approved by a majority vote of the Board of Mayor and Aldermen. The mayor selects the member who will serve as chair.